Crestani s.r.l. produces ampoules obtained from glass tubes of the First Hydrolytic Class according to ISO / DIN norms and customers' requests. The ampoules are manufactured to meet the pharmaceutical and cosmetic business. They can be classified as "cut open" and "flame-cut open" form B, "open cup" form C, "stem sealed dome type" form D and "stem sealed marzocchi type" form E.
For any type of filling machines, CRESTANI s.r.l. is in a position to come up with the most adequate ampoule typology to achieve excellent results both technical and "cosmetic". 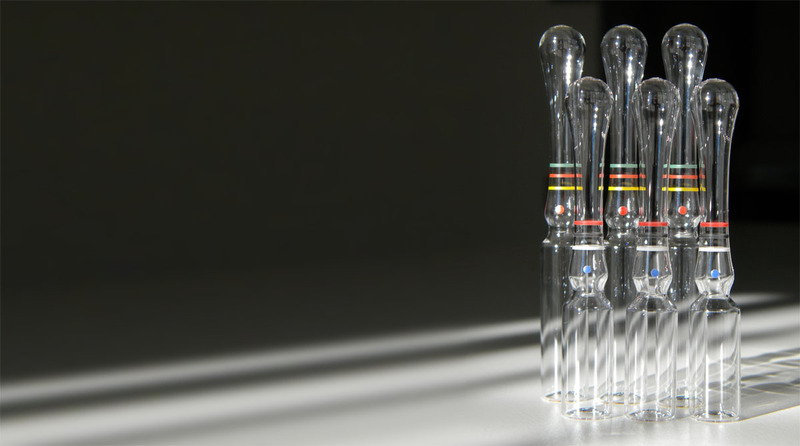 We supply our customers with ampoules whose dimensions range from 1 ml to 25 ml. Fresh image and a precise custom-made product as a result of the on-line silk-screen equipment make CRESTANI s.r.l. a streamlined and a flexible company. Backed up by sound basis, CRESTANI s.r.l. comes to occupy a place in the market with the precise role of qualifying a product which is already of high quality, thus also involving and benefiting the end-user. It goes without saying that high quality results demand high quality ampoules.